This page compares MU-OFDMA vs MU-MIMO and mentions difference between MU-OFDMA and MU-MIMO in WLAN 802.11ax. MU-MIMO is used to increase overall capacity by transmitting multiple streams simultaneously. 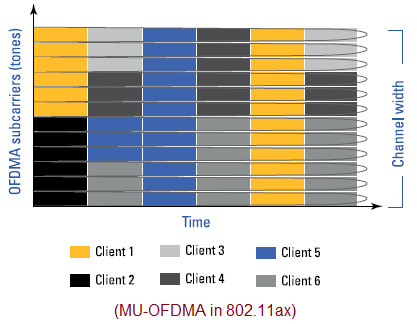 MU-OFDMA does not increase capacity but it uses it more efficiently by allocating subcarriers to users based on their needs. Both MU-MIMO and MU-OFDMA complement each other. • OFDMA is multi-user version of OFDM used in 802.11a/g/n/ac. • It allows multiple client devices (i.e. users) with varying BW to use wifi network simultaneously. • OFDMA divides wifi channel into small frequency allocations known as RUs (Resource Units). • AP communicates with individually assigned clients simultaneously due to their unique allocations of RUs. • The figure-1 depicts MU-OFDMA in which channel bandwidth is divided into number of channels. Each of these channels can be used by multiple clients at different time instants unlike previous wifi standards. • Refer MU-OFDMA basics >>. • As shown MU-MIMO uses different spatial streams for communication between multiple client devices. • It uses beamforming technique to provide unique connection with desired clients. 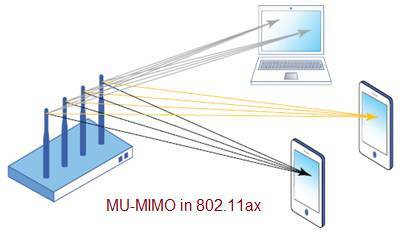 • Minimum RU size to use MU-MIMO in 802.11ax is 106 subcarriers or higher. • IEEE 802.11ax technology uses both MU-MIMO and MU-OFDMA together. OFDMA offers multiuser access by dividing single channel into multiple subcarriers. MU-MIMO offers multiuser access by using different spatial streams. • MU-MIMO is ideal for very low client density and high BW applications in which large packets are used for transmission. • Refer MU-MIMO basics >>. Following table mentions difference between MU-OFDMA and MU-MIMO. Function MU-OFDMA offers multi-user access by division of channel. MU-MIMO offers multi-user access by using different spatial streams. Also refer difference between MU-MIMO and OFDMA >>.